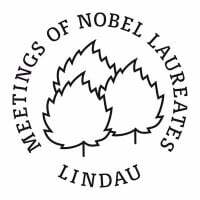 Yet the Lindau Meeting excluded discussion on cosmic dust in cosmology, instead focusing on dark matter based on the anticipated discovery of exotic WIMPs from the LHC experiments. But cosmic dust is of greater importance to cosmology because light from a distant galaxy is redshift upon absorption in cosmic dust without the Doppler shift. Therefore, the redshift Hubble measured in 1929 was most likely caused by cosmic dust having nothing to do with an expanding Universe. Hence, there is no need for dark energy to explain an expanding Universe that is not expanding. Moreover, MOND and surveys of gravitational lensing that support the presence of dark matter are also negated by cosmic dust. See http://www.nanoqed.org at “Dark Energy and Cosmic Dust” and “Reddening and Redshift,” 2009; and “Cosmology by Cosmic Dust -Update,” 2010. QED induced redshift holds in question the Hubble redshift as proof the Universe is expanding beginning with the Big Bang suggesting a return to a static Universe in dynamic equilibrium once proposed by Einstein. Moreover, astrophysical measurements that rely on Hubble redshift by the Doppler effect grossly over-estimate the rotational velocities of spiral galaxies are far faster than allowed by Newtonian mechanics, thereby suggesting the presence of dark matter to hold the galaxies together. Indeed, redshift in cosmic dust instead of by the Doppler effect answers most of the outstanding problems in cosmology Ibid. The conclusions are. The Lindau Meeting on cosmology by elementary particles is trumped by cosmic dust. There is no connection between any findings forthcoming from the LHC on how WIMPS or other exotic particles are related to dark matter. Smoot’s comment on how tiny particles dictate what the Universe looks like was misinterpreted by all of the attendees including Smoot himself because no one considered the tiny particles to be submicron cosmic dust. Hubble’s redshift by the Doppler Effect held for 80 years needs to be set aside and superseded by QED induced redshift in cosmic dust, an unpleasant, but necessary action by astronomers if cosmology is to move forward. High thermal conductivity of amorphous silicon – a quantum mechanics size effect? Are phonons the mechanism of heat transfer at the nanoscale? At the nanoscale, does heat conduction even exist? What is the heat transfer mechanism at the nanoscale? If a heat transfer mechanism at the nanoscale is hypothesized that promptly conserves absorbed heat without any need to include conductive heat flow, the difficulties in explaining experiments by phonon wavelengths would be avoided. Bulk conductivity could then be assumed at the nanoscale even though there is no heat flow. Indeed, if such a heat transfer mechanism can be shown to exist, then all the above questions are answered. One such heat transfer mechanism at the nanoscale that avoids phonons is the theory of QED induced EM radiation. QED stands for quantum electrodynamics and EM for electromagnetic. By this theory, absorbed EM is promptly conserved by the QED induced creation of photons within the nanostructure that then are emitted to the surroundings as non-thermal QED radiation at UV or higher levels. What makes this possible is that quantum mechanics requires the specific heat of atoms at the nanoscale to vanish. See http://www.nanoqed.org/ at “Nanofluids and Thin Films”, 2009. Vanishing specific heat may be understood from the fact the thermal energy of the atom given by the Einstein-Hopf relation depends on wavelength under the constraint that only submicron (< 1 micron) wavelengths are allowed to “fit inside” nanostructures. 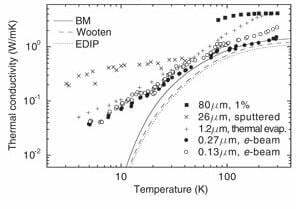 But submicron wavelengths are only populated at temperatures greater than about 6000 K. At ambient temperature, therefore, the heat capacity of nanostructures is “frozen out”, and so absorbed EM energy cannot be conserved by an increase in temperature. Conservation may only proceed by the QED induced frequency up-conversion of absorbed EM energy to the fundamental resonance of the nanostructure. Heat conduction is negated because the prompt conservation of absorbed EM energy by QED emission is far faster than the time it takes for the phonons to respond. Ibid, at “QED induced heat transfer”, 2010. 1. The conclusion that size in terms of the sample thickness is not expected to make a significant difference in measured conductivity for the 80 micron and 200 nm samples is negated by the size effect of quantum mechanics. 2. Conductivity appears reduced in submicron samples because QED induced radiation was excluded in the heat balances. If included, there is no conduction, and therefore the sample may be considered to have bulk conductivity under the condition of no heat flow. In fact, both submicron and 80 micron samples have bulk thermal conductivity. 3. Conclusions that phonons with a mean free path of ~ 100 nm make a sizeable contribution to conductivity not only contradict the fact current theoretical methods based on phonons cannot explain the higher conductivity of the 80 micron sample. In fact, both are meaningless because there is no conductive heat flow at the nanoscale. 4. TDTR measurements are likely caused by QED induced photons and have nothing to do with phonons. 5. The response of nanostructures to absorbed EM energy need not be determined by MD simulations; the only relevant MD simulation might be the interaction of the QED emission with the surroundings. The problem with epithelial tissue as the source of DNA damage is that the protein Rac1b lacks a mechanism to produce energy of at least 5 eV from which the ROS of peroxide and hydroxyl radicals form to damage the DNA. The ROS can only be produced by ionizing radiation > 5 eV at ultraviolet (UV) levels or beyond. But what is the mechanism of ionizing radiation? Certainly, there are no UV lasers in body fluids. The hypothesis may therefore be made that epithelial tissue during disorganization somehow emits low level ionizing radiation. Cancer research is only beginning to recognize the remarkable fact that submicron entities present in body fluids emit low-level ionizing radiation. Over the past few decades, this fact has been supported by experimental evidence that shows submicron entities comprising nanoparticles (NPs) of natural and man-made materials cause DNA damage. Remarkably, the NPs alone – without lasers – somehow induce DNA damage in body fluids. 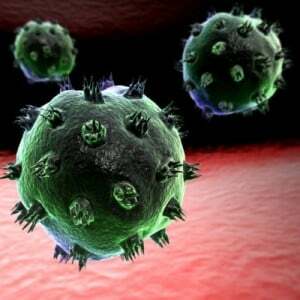 See http://www.nanoqed.org/ at “DNA damage by NPs”, 2009 and “DNA damage by signaling,” 2010. Epithelial tissue like NPs induce DNA damage provided submicron entities are produced upon disorganization by MMPs. QED induced radiation is emitted if the size of the biological entity is < 100 nm and has a refractive index greater than the surroundings. For biological materials, the index is about 1.5 > 1.33 for water. But epithelial cells themselves are not submicron and at 10-100 microns in the disorganized state do not emit ionizing radiation. However, ionizing radiation is emitted from the < 100 nm BM upon disorganization of epithelial tissue by MMPs. 1. During disorganization by MMP-3, the BM emits QED induced ionizing radiation forming ROS that damage the DNA and produce the Rac1b protein found in most cancers. 2. Contrarily, the ROS are not induced by Rac1b to stimulate the development of cancer by directly affecting genomic DNA. Rather, the ROS are formed in a side reaction from the QED induced radiation emitted from the disorganized BM. Nevertheless, the Rac1b protein as a submicron entity is the product of the ROS and may also damage nearby DNA. 3. Loss of epithelial tissue organization produces QED induced EM radiation that damages the DNA before mutations occur in the genome of the tumor cell by other factors. 4. Oncogenes are activated by QED induced radiation from changes in the BM structure by MMPs. 5. UV absorptive drugs may be used to reduce QED induced radiation and attendant DNA damage from epithelial tissue disorganization by MMP-3.